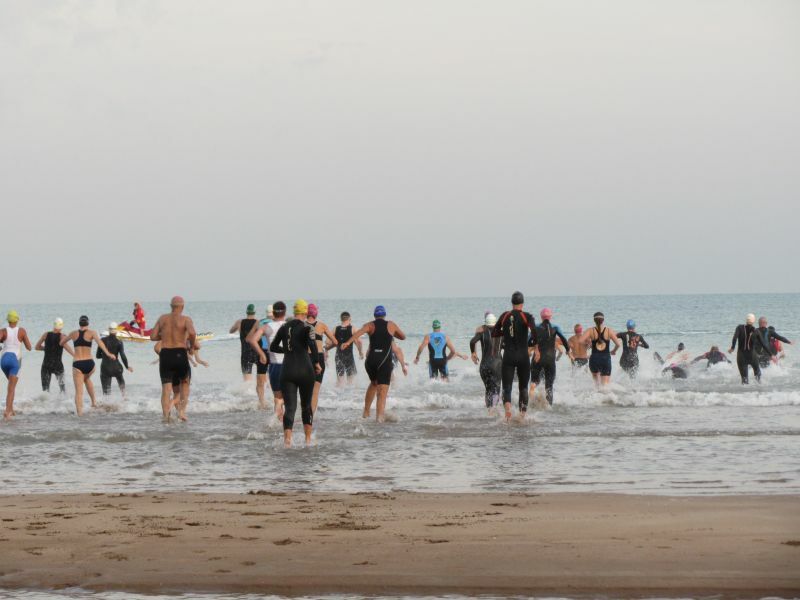 We scored brilliant dry season conditions for our Open Water Triathlon (& du option) at Casuarina Beach yesterday. With so much happening at this time of year, fifty five participants was a great turnout, and we had a number of new members taking part for the first time. Our thanks to RD’s Tim and Bec Ellison who set the course, shaking up the early morning grey cells with a few changes on the last event at that location. We all act on auto pilot apparently but eventually all were herded to the correct start point and the event got underway, accompanied by the surf lifesaving crew. From all reports, the swim was awesome! Thanks also go to all our wonderful volunteers who did rego, timing, marshalling & fruit/ice as well as those that helped set up and pack away. Special thanks to the Cooks, who stepped in to tow the trailer when we put out an urgent call for someone to tow the trailer. Without them coming forward, we were looking like having to scale back to a swim, run event. 1. Tickets on sale here now & we encourage you to assist the volunteers organising this function and get your tickets now. 2. This is our social event of the year and a great opportunity to find out what fellow members look like when they aren’t dressed in lycra and sweating profusely! 3. Numbers are required for catering & seating by end of week. 4. Lucky door prizes to be won on the night. 1. We are currently seeking volunteers to fill the rolls of Race Director, Registration x 2, Timekeeping x 2 & Fruit/Ice at our events up until the end of this year. 2. A number of “how to” guides are located at the bottom of the Events Page on our website. We encourage you to have a look at what is required of the various rolls and then commit to an event. 3. There is an expectation that all our members will be on roster at least once each year so we hope to see your name soon. 4. Have a look at the calendar and email your preferred date here. 2. FOR SALE: Hayden fibre glass surf ski in excellent condition. Comes with Carbon Fibre Hammer paddle and Polar Roof Rails with surf ski attachments for your vehicle. $800 ono. 1. Good to catch up, albeit briefly, with former committee member Geoff Cruickshank yesterday. Welcome back Geoff, hope to see you tri-ing again soon. 2. One for those interested in engineering & bike speed - check this video out. Warning it is about 9 mins long so you may want to watch this at home! 3. We have decided on our Dag of the Year award winner! We had some interesting nominations. Will it be you? All will be revealed at Presentation Night Dinner. 4. The IM Kona pro points ranking is experiencing a bit of a traffic jam at the pointy end. Early points qualifiers get the nod this week. A recent quick check showed 576 males with points and 305 females. 5. 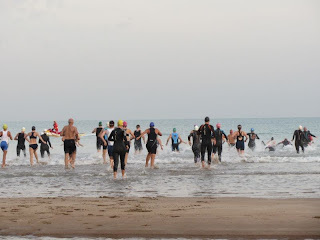 Monica Stewart, Bianca May, Melanie Thomas and Karen Lewis are getting closer to their London departures and were all in action at the Open Water Tri. Looking good girls! 6. Good luck & good weather wishes to Grant Preddy and Rowena Eastick who are heading overseas for IM 70.3 Philippines this weekend. 7. Apologies to those who found our Member Survey link featured in last E News was closed. It maxed out at 100 responses. If you didn’t get your preferences in them, you can now do so here until tomorrow. 8. On surveys, members would also have received a invite to participate in Triathlon Australia’s member survey. Check your inbox.